Creative Ideas for Ministry with the Aged is a wise, timely and practical handbook that meets the urgent need for resources for ministry among the elderly. Written out of the author's own experience as a chaplain to a residential care community, it is suitable for ministers who visit the elderly; chaplains, pastoral visitors and caregivers; and all who help train others in elderly pastoral. Part 1 explores the key theological elements of ministry with the aged, focusing on themes such as the sacrament of the present moment. It asks what constitutes spiritual care and conversation with those whose minds and bodies are failing? Part 2 provides and simple service outlines for 'reconnecting with old treasures'; and includes liturgies for communion services, services of the word and remembering special days. Parts 3 and 4 offer imaginative ideas for pastoral practices and spiritual activities using prayer, song, laughter, memory, touch, anointing and more to address questions of loss, letting go, forgiveness, dying and resurrection. 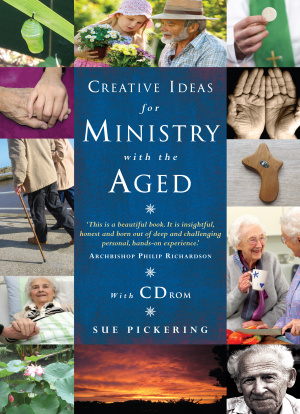 Creative Ideas for Ministry with the Aged by Sue Pickering was published by Canterbury Press Norwich in September 2014 and is our 27276th best seller. The ISBN for Creative Ideas for Ministry with the Aged is 9781848256484. A great addition to an already good series of books. Our population is growing older with the majority of people being over the age of 40, and this is very much reflected in many of our church congregations. This book provides a great framework for working alongside those in the upper brackets of years. This is a great book for anyone who wants a great resource as they work alongside and minister to an older population. Take a peek at some articles related to Creative Ideas for Ministry with the Aged. Got a question? No problem! Just click here to ask us about Creative Ideas for Ministry with the Aged.